It is stated there the Tai Dam are populating an area between Laos and Vietnam. And the flag has a sun with 24 rays. According to Thomas A. Cseh & John Sylvester Jr the "T'ai Federation, the semi-autonomous area around Dienbienphu, established on March 4, 1948, comprised the traditional sixteen 'chau' (cantons) of the T'ai people. Their flag was composed of three equal vertical design was also pictured on the distinguishing insignia worn by military units made up of ethnic T'ais who fought for the French Far Eastern Expeditionary Corps' First and Second Battalions between September 1946 and October 1949." It is my educated guess, that the Jaume's flag with 24-rayed sun represents the more modern variant of the T'ais' ethnic flag. The Flags of Aspirant Peoples lists this as 164. "Khmer Mountain Tribes - Central Vietnam, war flag." Identical to above image. The 1987 flag of Dega Association in Greensboro, NC, which is supposed to be the flag of all Dega people, was obviously modeled after the earlier flag used in South Vietnam during the war. The significant difference might be the removal of the yellow, Vietnamese, color from the Greensboro flag. Thomas A. Cseh & John Sylvester Jr tell us about the earlier flag: "The Ethnic Development Ministry of the RVN (Republic of Vietnam) government established an organization to rally support of minorities for its anti-Communist campaign. Known as the Movement for the Unity of Ethnic Groups of South Viet-Nam, this body had a song and flag of its own. The traditional culture of the Highlands region where the minorities were concentrated was symbolized by the head of an elephant, said to stand for prosperity and peace. The head and the ring around it were white, a color representing love, the ring suggested unity between the minorities and the Vietnamese ethnic majority. The flag had equal stripes of green (top), yellow, and red. These stood respectively for the mountains and jungles of the Highlands, the Vietnamese national color, and the spirit of common struggle on behalf of the fatherland." Makes you wonder what the meaning of the broken, golden ring of Greensboro flag is? The other flag mentioned, the green one with the multipoint star is a flag of the Khmer Mountain Tribes, associated with the Kampuchea Krom movement, who were part of the Dega dominated alliance in the later 1960s - FULRO - United Struggle Front for the oppressed Races. FULRO, in turn, developed from the purely Dega organization from the early 1960s - the BAJARAKA Movement.Its name is derived from the names of 4 main Dega tribes: Bahnar, Jarai, Rhade and Koho. The flag of BAJARAKA Movement was often erronously attributed to the Chams (Champa) in the various vexillological sources.. The real flag of the Chams is correctly depicted on the FOTW page. It is a flag of FLC - Le Front pour la Liberation de Cham, which was also included in FULRO in later 1960s, together with Degas (Montagnards) and Khmer Mountain Tribes. The Flags of Aspirant Peoples chart shows this as: 165. "Champa Independent Republic, 1965 (Chams) - Central Vietnam." The image is similar to above but with larger blue stripe, lighter blue and star not pointing upwards. Thomas A. Cseh & John Sylvester Jr show another, unusual flag of the Cham Liberation Movement which, they state..." cooperated with FULRO but also had its own flag which it hoped some day to have flying over an independent Champa (as they call their land). The flag was divided vertically - green at the hoist with white crescent and star, red at the fly, and the center divided into horizontal bars of blue and white." The Chams are Muslims, who once ruled over most of Central and Southern Vietnam as a powerful Kingdom. Before conversion to Islam they used to be mostly Hindu. Again, the Socialist Republic remembers on which side they fought in the war and punishes them accordingly. The dream of a new Champa will remain just a dream for the time being. This flag is the flag of the Front de Liberation des Hauts plateaux. The flag was adopted in March 1946 when four highlanders tribes united in the fight for independence. The hoist band must be red (the report of green published in Flaggenmitteilung 105, was later corrected in 109) and the crescent and star is for the Cham tribes Zyaray and Edeh. The green band is for Montagnard tribes Banar and Koho and mean the nature that they pledge. The four blue stripes (blue above and below) mean the unity and the three white stripes mean the freedom. The first name of the organization was "Front des Petits Peuples" (1946-1960). In 1960 the name was changed to Front de Liberation des Hauts plateaux andstill later in 1960 joined the FULRO, together with the Front of Liberation of Champa. The members list of UNPO includes Khmer Kampuchea Krom. Kampuchea-Krom means "Cambodia Below" or "South Cambodia". Kampuchea-Krom was the southernmost territory of the Khmer Empire, and it was once known as (French) Cochinchina. It is the southwestern part of Vietnam. It covers an area of some 89,000 km2 with Cambodia to the north, the Gulf of Thailand to the west, the South China Sea to the southeast and the Champa's territory to the northeast. [...] It is estimated that there are about 8 million Khmers living in Kampuchea-Krom. Approximately 80 percent of them live in the Mekong delta, and a small number is in other provinces throughout the southern part of Vietnam. Besides the Vietnamese, there are other people living in Kampuchea-Krom, including the Chinese, the Chams, the Mountgards, and many other small ethnic groups. [...] The Khmer Krom are represented in UNPO by the Khmer Kampuchea Krom Federation. The three branches of the federation have been elected from the representatives of Khmer Krom constituencies around the world. 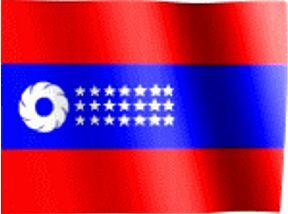 The official Khmer Krom website also shows a logo with these colours. RED: Symbolizes the blood sacrificed by the courageous Khmer Kampuchea Krom who endeavor to liberate and stand as vigilant guardiansof the Motherland. BLUE: Embodies the pristine beauty of Kampuchea Krom's freedom and Her dedication to the tenets of democracy. 21 STARS: Represent the 21 Provinces of Kampuchea Krom. CHAKRA: The symbol of the strength and dominance of the Khmer Kampuchea Krom over all Her enemies. The Chakra(disc-like weapon) as depicted on the national flag of India. The Sudharshana Chakra is associated with Lord Vishnu, the preserver, and was used to subdue evil, ... And with the Lord Buddha, the Dharma Chakra is seen as the use of philosophical and metaphysical powers against the forces of evil. The flag of Mnong (a.k.a. M'Nong Bu-dang) people. They are highlanders of the so-called Montagnards tribes of Mon--Khmer origin. 60, 000 in Vietnam: 20,000 in Cambodia. Once part of the mighty Champa Kingdom. Notable for the extraordinary skills in domestication of elephants. During the turmoil in Vietnam, members of FULRO alliance. Supposedly, one star in the FULRO flag is dedicated to them. For taking part in the Vietnam war on the wrong side, persecuted severely by the Socialist Republic. Many fighters and families repatriated to the US. They used the "green flag with a five-pointed white-outline star similar to that of Morocco, the five points represented the five districts of the Mnong area." (Thomas A. Cseh & John Sylvester Jr - The Flag Bulletin #190 1999). The similarity of their ethnic flag to the Moroccan one can be explained by the presence of the large numbers of the Moroccan troops in the Highlands during the French Indochina wars of 1950s.